Kids Ink is an experience! Every day my children come home with a story of something new they did. Whether it’s cooking, going to the library, a trip for pizza, or a Chinese New Year celebration everything is done with the desire to make my children’s day the best! Kids Ink inspires my children’s imagination and desire to learn. They look forward to their gym time, gymnastics, and rock climbing – no other school can touch the activities that are offered! The staff is kind, caring, and goes out of their way to make every day special, Kids Ink is not just a daycare it’s a family! Kids Ink is the best daycare and preschool in the area. They offer so many fun activities for the kids in their care. My kids love the gym best. Twice a day they get to run around, jump in the moon bounce, and play sports. They even have gymnastics and rock climbing right at the school. The teachers are all really great and concerned about each child’s needs. They have a strong curriculum that focuses on preparing children for school, but is still based most on having a good time. 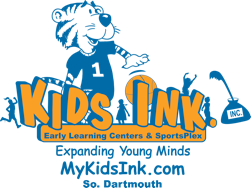 My kids wish they could go to Kids Ink every day, which is just what you want from a daycare center! My child has attended Kids Ink since he was 6 weeks old! We absolutely love the wonderful, kind staff and cozy classrooms. He is now 4 years old and has gone from Kids Ink to Kids Ink Too and has many memories of the time he has spent there. We wouldn’t have chosen any other school. The large gymnasium at Kids Ink Too is awesome and offers many activities for all ages year round!! If you like what we do, then please, take a few minutes to fill in the form below. Equally, if you are not totally satisfied, please call us, or use the form below to arrange and appointment.